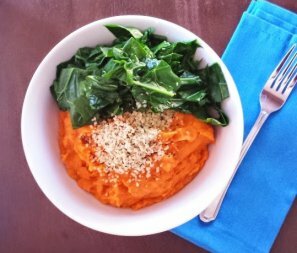 This is sweet potato dish is an easy lunch to make for a busy day or a nourishing dinner to fix when it's cold outside! The creaminess of the sweet potatoes mixed with the slight crunch of the greens will leave you feeling satisfied and healthy. I really like baked sweet potatoes, but the time they take in the oven doesn't always work with my schedule. So I've started making creamy sweet potatoes instead. You simply boil 1 inch pieces in water for about 10 to 15 minutes until they are soft and ready to be mashed. I use an immersion blender but a regular blender or food processor will easily make them just as smooth. Sweet potatoes are a great source for potassium, vitamin B-6, vitamin C, vitamin D, iron, and magnesium. Hemp seeds will give you omega-3 and omega-6 fats, lots of fiber, and magnesium. The greens provide you with a great boost of calcium, vitamin A, and vitamin C! Put the cut sweet potatoes in a medium pot and cover with water. Over high heat, bring it to a boil and turn down to medium. Cook for 10 to 15 minutes until the potatoes are easily pierced with a fork. While the potatoes are cooking, place the greens in a steamer basket and bring water to a boil. Steam the greens for about 5 minutes, or until slightly tender. When the sweet potatoes are done, put them in a medium bowl if you are using an immersion blender, or right into the blender or food processor. Blend until smooth. Mix mashed sweet potatoes in the ghee until melted. Put the greens on top of the sweet potatoes and drizzle with lemon juice. Add salt and pepper to taste. Top with hemp seeds.